The UNIMUX™ High Density DVI USB KVM switch allows you to control up to 32 single link DVI USB computers with one DVI-D monitor, USB keyboard and USB mouse. 24- and 32-port switch is 2RU in height. Hold in any button for more than five seconds to go into Scan, Broadcast or Command Mode . In Normal Operating Mode , the user can directly operate the selected computer with transparent presence of the NTI switch. Scan Mode automatically and sequentially displays the video from each powered on computer for 2-255 seconds. Command Mode allows the user to give instructions to the switch through his/her keyboard. Keystrokes are not passed to the computer. Scan, Broadcast or Command Modes are available from the keyboard using hot keys. Type <Ctrl>+<`> (or <Compose>+<`>) to go into Command Mode . Press <Esc> to leave Command Mode and return to Normal or Scan Mode . Baud rate 2400, 9600, 19200, or 38400. Use DIP switches to set the baud rate and address up to 16 units, all of which can be daisy chained and controlled by one serial port. 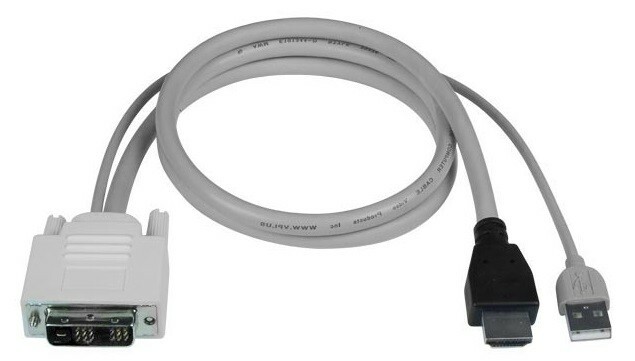 5-foot (1.5-meter) CAT5e patch cable, RJ45F-DB9F and RJ45F-DB25F adapters included. CS – connect output (user) port to specific input (CPU) port. RO – reads what input is connected to the output. RU – reads size of switch. The ST-C6USBH-HDBT HDMI USB KVM Extender over HDBase-T can be used to extend the computer and/or monitor/keyboard/mouse connections up to 328 feet away from the UNIMUX-DVI-xHD. When extending a computer connection from UNIMUX-DVI-xHD using ST-C6USBH-HDBT, the extender can be in either Win or MAC mode. When extending the keyboard/mouse from UNIMUX-DVI-xHD using ST-C6USBH-HDBT, the extender must be in MAC mode. "The UNIMUX-DVI-8HD KVM switch is compact, and remote control is easy. I like the simple, lightweight cables to connect between servers and the switch. Switching between servers is fast, and we don't have any issues with drop out." "The UNIMUX-DVI-8HD is a high quality dependable KVM switch. We have tried other switches and most seem to lag when switching ports. The NTI switch allows us to switch ports quickly." "The 16-port High Density USB DVI KVM Switch was used to toggle between 14 DVI inputs with mouse and keyboard functions. We have chosen this model because it is capable of handling high video resolutions such as 1920x1080, as in our application. The setup was very easy, and the operations did not need any special knowledge. We are pleased with the product, and will be using it in our future system designs." "The UNIMUX-DVI-16HD is great. I love having DVI (finally!) and with enough ports (finally!). I also like that I can boot my multiple computers with multiple operating systems with no regard for the UNIMUX switch. (ie I can boot them all at the same time.) It is great having the smaller cables with a simple and single USB connector at the PC side. All of these features really help me to be more efficient."